Sensex – 1000 Points down in two days ! The last two sessions on Sensex have been surprising scary and unexpected with a quick drop of 1000 points. None of the supports in between have been respected. This gives a scary feeling but we have been getting such corrections often but not so quick. Such a steep correction indicates there is something wrong in the market or its one big trap. But in either case its a difficult bet to take. Technically the short term trendline has been broken with ease. On the weekly charts it should be considered as a re-test of the breakout at 18500 levels. The channel for the same comes around 18800 zone. Also 200 dema comes at 18800. But any action from support levels can be taken only if there is some follow up buying or reversal signals else one needs to be strict with stoplosses and risk-reward. In the next 2-3 sessions we would need to watch 19100/18950 and 18800 very closely as in such strong moves supports maybe broken but we need to see how it closes over the next few days. 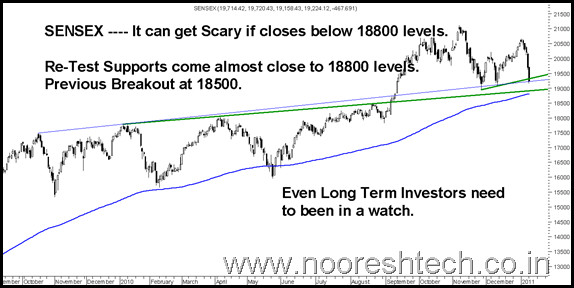 Sustained closing below 18800 will dent the long term outlook and even investors with long term view should be watching the markets over the next few sessions. Although on a simpler basis the multi-year outlook may change only on break of 17800 but a drop below 18800 would make this market a sideways and boring market. Ever since Jan 2008 never has the RSI went below the above red line. So any further drop will take it to highly over sold zones. So if market has to break 18800 it has to be a panic or reason beyond the panics seen in Jan 2008 or Oct 2008. Also the volatility Index has spiked up. So in next 3 sessions it should either find a bottom or create a panic. Time to Wait and Watch and not hurry into any conclusions. We may re-enter longs a little higher but with more comfort and conviction. Its been one of the toughest times to trade ! Earlier we had advised people to control panic at 19000 levels as well as to exit all speculative longs and margin longs at 20300 and start being disciplined. Thereafter quite a lot of trades on Sugars, Metals gave nice returns and IT Midcap flopped but not cracked. For now if you are holding on to long term positions keep watch over the next few days before taking a call. Buy selectively with a stoploss of 18500/18800 on closing basis but only quantities to which you can see notional losses as well as ready to exit if need be. Ideally i would like to watch for the next 3 sessions before taking a call. Till then i remain highly optimistic in the Medium term. The last two downmoves we were not able to pick 🙂 cant be right always. But we made it up by picking the last two bottoms and by not panicking also certain sectoral calls like Sugars and Metals saved us. Yes i am more of a bullish fella. But this time around too at 20300 had mentioned no leverage longs and 19900 is a stop for all. So all we need to do is increase the no of times we go right. Your all views are always welcome. But your RSI chart is as of now not perfect view that it will bounce after reaching below 30 RSI. That time some strength needed to come up or for bounce back. 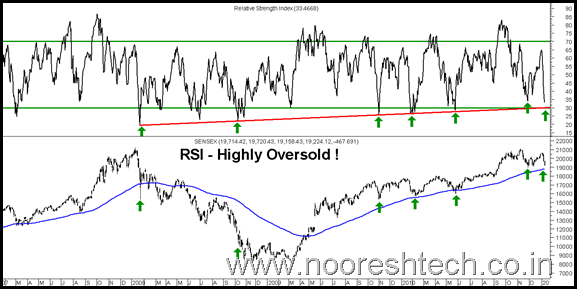 It’s my view regarding RSI indicator which is always 99% work in stock related analysis (bottom out stocks). Hope so u get me very well by TECHNICAL MANNER!!! Please look into the chart posted and see the arrows and u will come to know. INVESTORS ARE BEING FOOLED BY MARKETS,BY BUY AT HIGH AND SELLING AT LOWS. We took a sell at 19900 and have bought today at 19000-19100 levels to the extent of 50-70% with a view of 18800/18500 stoploss. I remain optimistic in the medium term. 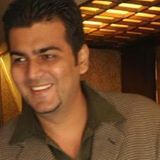 Nooresh, Whats your take on Bharati Shipyard?